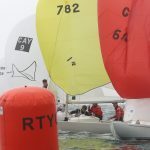 Light and shifty winds combined with a sea left over from the big on shore breezes of the previous day created new challenges for the 28 teams competing in the Dragon Edinburgh Cup at the Royal Torbay Yacht Club. 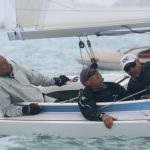 The day’s first race got away cleanly in 6-8 knots of breeze. Laurie Smith’s Alfie tacked onto port early, which quickly gained him an early lead and he was soon followed by a number of others. Around 15 minutes after the start the wind began to swing to the right as a band of light rain moved across the course, giving those in the right a significant advantage. 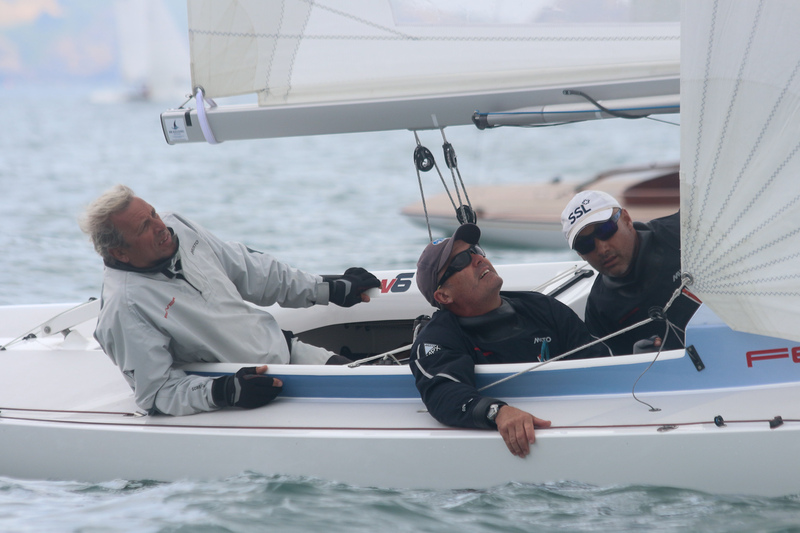 Smith was first to round the windward mark, followed by Bocci (Atsushi) Aoyama’s Yevis ll and Louise Racing. Peter Cunningham’s Power Play rounded fourth, followed by the only lady helm in the fleet, Gavia Wilkinson-Cox, in Jerboa. However, Bailey – overall leader after the first two races – was unusually buried, languishing back in 16th place. 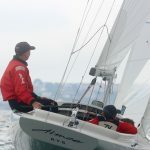 The leaders extended away quickly on the run, but the wind then eased as the sun returned, leading to a tricky balance between sailing high and gybing through less painfully large angles. 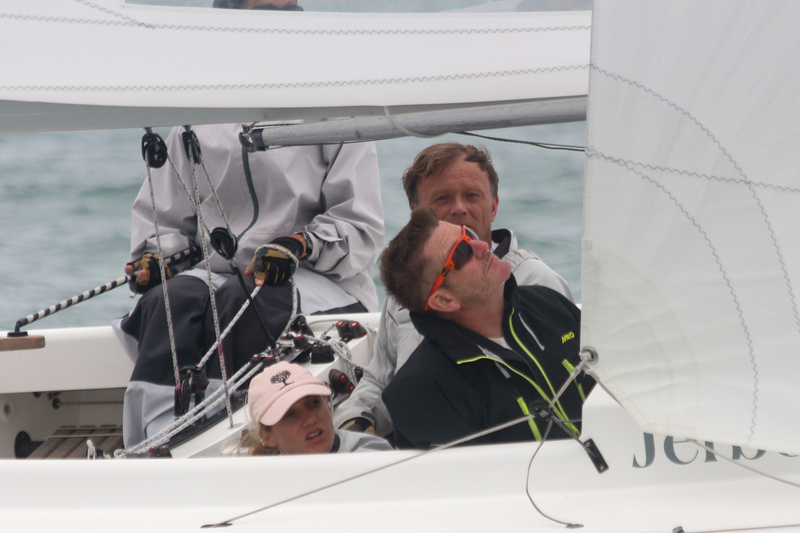 Louise Racing rounded the right hand leeward mark first, followed closely by Power Play and Jerboa. However, Klaus Diederichs’s Fever and Alfie were first to the advantaged left-hand side of the gate. Fever took first place, ahead of Jerboa and Alfie, while Power Play benefitted from being the left-hand most boat among the leaders to finish fourth, while Gordon took fifth. 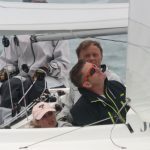 The fourth race in the series started in more consistent conditions, with a 6-8 knot easterly breeze. 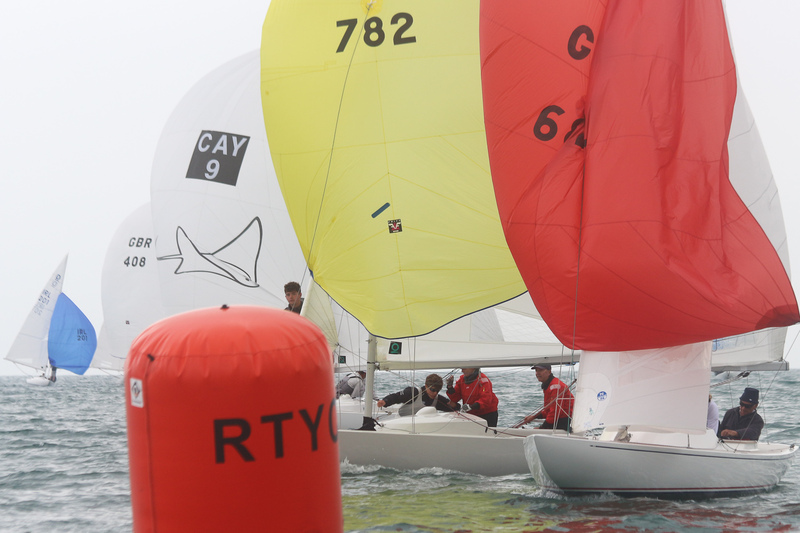 Jono Brown’s Storm and Peter Cunningham’s Power Play appeared to be best placed of the boats near the pin and the fleet quickly tacked onto port as the wind shifted left after the start. 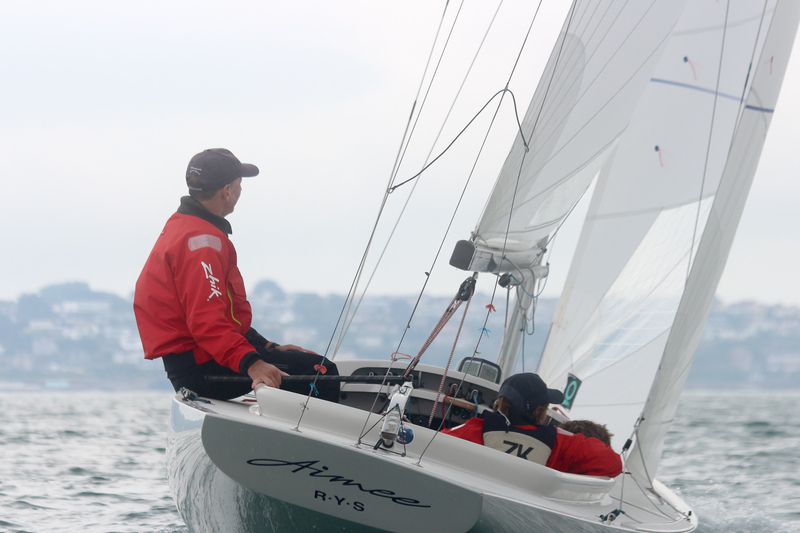 Aimee then flipped back onto starboard, becoming one of the left-hand most boats in the fleet in the early stages of the first beat. Meanwhile, Alfie remained on the right-hand side, while Louise Racing held a more intermediate position between the two. The latter rounded the windward mark first, followed by Tom Vernon’s Badger, Alfie, Storm and Jerboa. The boats on the right hand side of the first run again appeared to be advantaged. By the end of the leg Louise Racing had pulled out a 43 second lead on Storm, with Badger dropping down to third, while Alfie slid down to fourth place, 10 lengths further back. Gordon then continued to extend his lead for the rest of the race, finishing more than two minutes ahead of Eric Williams’ Ecstatic. Alfie took third and Jerboa fourth. 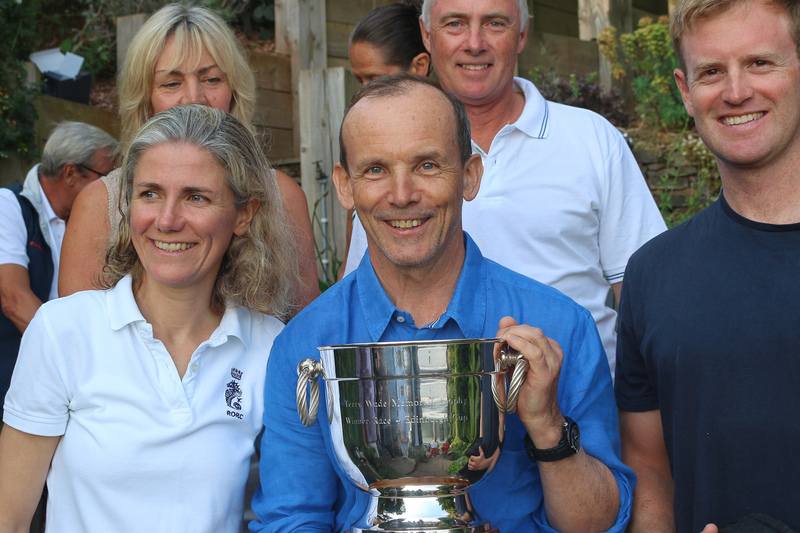 A vibrant social scene is a core part of the success of the Dragon class and the day ended with a barbeque, prize giving and live band, hosted by Gavia Wilkinson-Cox. 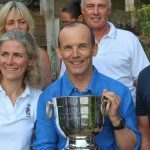 Among the daily prize winners, Grant Gordon won the spectacular Terry Wade Trophy for winning the fourth race of the series. Gordon now holds the overall lead, one point ahead of Alfie, with Aimee retains third overall, a further 10 points adrift. Jerboa is fourth, on equal points with Power Play. Aimee still leads the Corinthian fleet, ahead of Storm and Bertie.